As children get older their bedroom usually has to change to meet their needs – somewhere for a baby to sleep, becomes somewhere for a child to play. The issue with changing this space is that a child almost needs constant supervision, while redecorating a room can be time-consuming, complex and expensive. This list of top tips should help you transform your child’s room to meet their growing needs simply, safely, quickly and cheaply. 1. Give Yourself Room to Work. 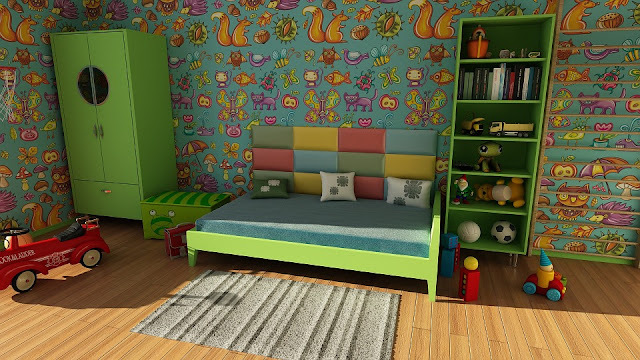 Before you get started, remember it’s not wise to redecorate a child’s room with the child around. It’s better to instead ask a family member to keep an eye on them in another room, as you work, or leave them with a friend or relative for a few hours, while you get the majority of the job done. Whatever the solution, you should aim to work quickly and get the new and improved room ready for your child as soon as possible. 2. A Lick of Paint. Changing the colour of a single wall can revitalise a room with very little effort. Painting a bedroom wall a child’s favourite colour can also make it a more personal space for them and help them to put their stamp on it. If you’ve got more time or you’re feeling particularly artistic (and are a dab hand with a paintbrush) you could go further and create a scene or mural on the wall. This could feature something your child really loves – princesses or pirates, for instance, or their favourite animals or cartoon characters. 3. Space to Play and Room to Work. A room for a baby usually just consists of storage space, while providing somewhere for them to sleep. As a child gets older this needs to change to make way for play areas, work desks and bedside tables. It’s best to move any clutter; boxes and stored furniture somewhere else. You should aim to create as much floor space as possible, ideal for them to complete school work, while providing room to play. As a child grows they will invariably outgrow their cot and need a new bed. It’s important to ensure the bed doesn’t take up so much space that there’s no room for them to play. So think about the size and style of the bed you buy – a kid’s sized bed, rather than a full-size single bed, for instance. You can also use empty space underneath the bed as an area for storage. Storing books, toys and games there, for instance, can free up shelves and space in the room that would otherwise be used up. Let’s face it, children have lots of stuff: clothes, books, toys, and games, which, if not kept in check, can (and will) get everywhere. Having simple but effective storage solutions, like large plastic bins, drawers and baskets can help keep everything organised. By investing in such storage units you can know where everything is, while your child can still easily find whichever toy they want to play with. Along with the coat of paint mentioned earlier, another way to quickly breathe new life into a room is from your choice of soft furnishings. If your child has got a new bed, this means you’ll need some new bedding and pillows, giving you an immediate opportunity to add some simple splashes of colour to the room. There are many department stores and online shops, such as eBay, that do soft furnishings with a theme. This means that if you did indulge those creative impulses, and crafted a mural on your child’s bedroom wall, you should be able to get cushions, curtains, bedding, cuddly toys and a rug to really help tie the room together. You might need to adapt parts of the storage as they grow up and, perhaps, paint over the pirates or princesses on the ‘feature wall’. But combining all these tips should give your child a room that any kid would be proud to their call own for years to come. This is a sponsored post provided courtesy of We Buy Any House.